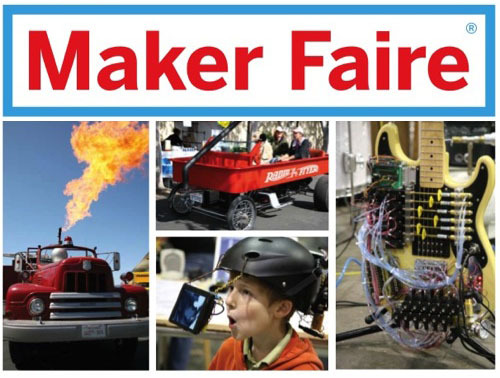 In addition to 900+ maker exhibitors, this 10th annual Maker Faire Bay Area features 12 stages and 4 attraction areas with over 300 scheduled presentations and shows! Go to Maker Faire Bay Area to check out the schedule, see a map, and read more about the exhibitors. Cañada College in Redwood City will host the 2nd LISTAS Conference to encourage and motivate young Latinas in the fields of science, technology, engineering, math and management! Come listen to Latina professionals from the Bay Area share their stories, professional careers, and tips on growing the next generation of successful Latinas. There will be workshops for middle/high school students and their families/mentors. Lighthouse Community Charter School in Oakland will host this awesome opportunity and participants may opt to receive 10 sets of materials to help support young makers in similar explorations and tinkering! Supplies and lunch will be provided, though we request that participants bring their own laptop. THIS IS A SPACE-LIMITED EVENT, SO SIGN UP TODAY! If you are unable to make the event but are interested in learning more, please contact me. I will be hosting the event at the San Francisco Public Library this April and would love to have you join us! Do you know a young maker between the ages of 17-21? The Bay Area Video Coalition and TechSF are offering a new program called Emerging Media Makers. The program is free for qualifying youth and gives them the chance to get certified in an area of media production-Coding For Non-Coders, Web Design, Motion Graphic Design/ Advanced Motion Graphics, or Experiential Design, as well as a paid $1800 internship, professional portfolio development, job coaching and more. It’s super flexible and can be designed around student schedules and completed in as little as two months. Sound too good to be true? Well, there a limited number of spots, but it is REAL! Want more? Youth receive a $200 Amazon gift card just for applying! Crazy, right?! Follow the link to learn more! DO YOU HAVE OTHER EVENTS OR OPPORTUNITIES THAT YOU WOULD LIKE TO SHARE WITH THE EDUCATOR ASSOCIATES COMMUNITY? BASF begins October 23, with activities and events stretching out into early November. AIAA Bay Area has partner with the Walt Disney Family Museum to bring you two special days of activities! AT&T park will be transformed into a science wonderland for the largest event of the Bay Area Science Festival – a FREE science extravaganza. Last year, more than 30,000 people enjoyed a non-stop program chock-full of interactive exhibits, experiments, games, and shows, all meant to entertain and inspire. With more than 150 programs, everyone can find something that will unleash their inner scientist. 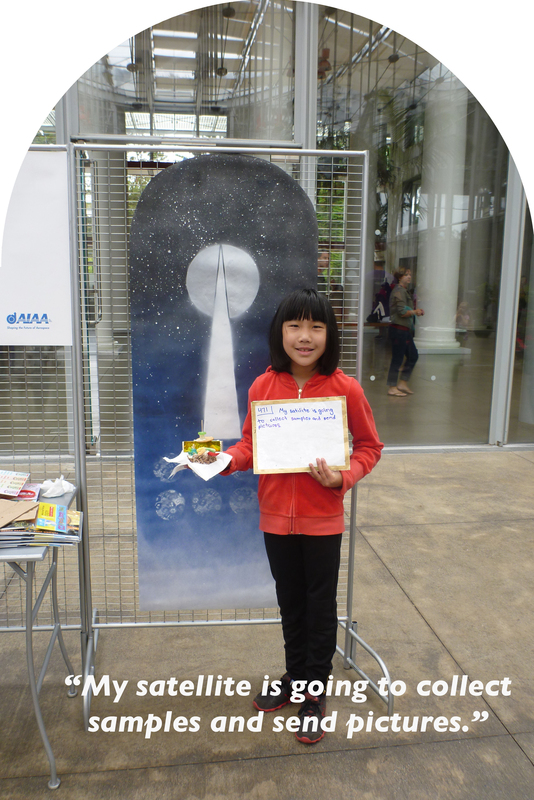 AIAA and the Walt Disney Family Museum will be leading satellite-building demonstrations and zoetrope building workshops, animating the phases of the moon! Come see us or contact studiolmtaylor at gmail to volunteer. Explorer Days highlight the incredible science resources in the Bay Area by offering a series of tours, hikes and active explorations for Bay Area families. This year, most tours will be on October 25th and 26th, with locations throughout the San Francisco Bay Area, however, Day of Space will be held on November 8th, so you can get plenty of other BASF events into your schedule. Come out for a unique, fun and educational glimpse into the scientific wonders of the Bay Area! Need some adult time, away from your kids and classroom, but still want to hear about the relationship between Walt Disney and NASA? Come on out to Nerd Nite, where Eric (Young Professionals) and Lauren (Educator Associates) will be giving an adult presentation covering their BASF topic! Nerd Nite sells out fast, so get your tickets early! From 11am- 2pm youth can participate in a craft activity to build their own satellite, learning the five basic components that all satellites need. They will leave with their own edible 3-D mock-up of their satellite design! Great for ages 6-12. From 2-3pm, join in as engineers from the American Institute of Aeronautics and Astronautics talk robot futures with research staff from the Cal Academy. And be sure to check out the new Dark Universe show in the Planetarium featuring Neil! You know which Neil. The American Institute of Aeronautics and Astronautics and the California Academy of Sciences are excited to have you join us for a day of family fun! Since Carl Sagan sent the Arecibo message to space in 1974, evolving technological capacities inspire us to reach out to other life forms and share our humanity with the future. Considering what it means to be a teen in San Francisco in 2014, the Spring Youth Advisory Board Artists at Southern Exposure worked to share their perspectives and lives with teens of the future, be they human or extra terrestrial. 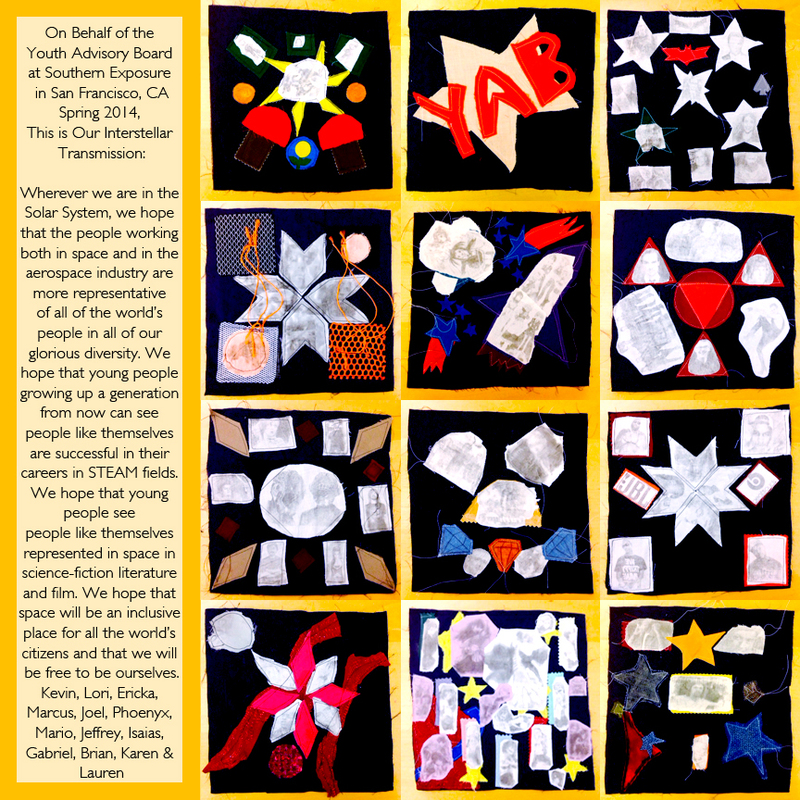 Their final projects were exhibited at Southern Exposure before they were documented to be sent aboard the Osiris Rex to Bennu in 2016, and to Houston where they will be added to NASA Astronaut Karen Nyberg’s work for the International Quilt Festival, on display in Fall 2014. Given our strong commitment to STEAM education, we offer free AIAA Educator Associate membership to K–12 educators. Educator Associates must be K–12 teachers with an interest in tying Science, Technology, Education, the Arts, or Math (STEAM) into your class. Your Educator Associate membership remains valid as long as your email address is current. 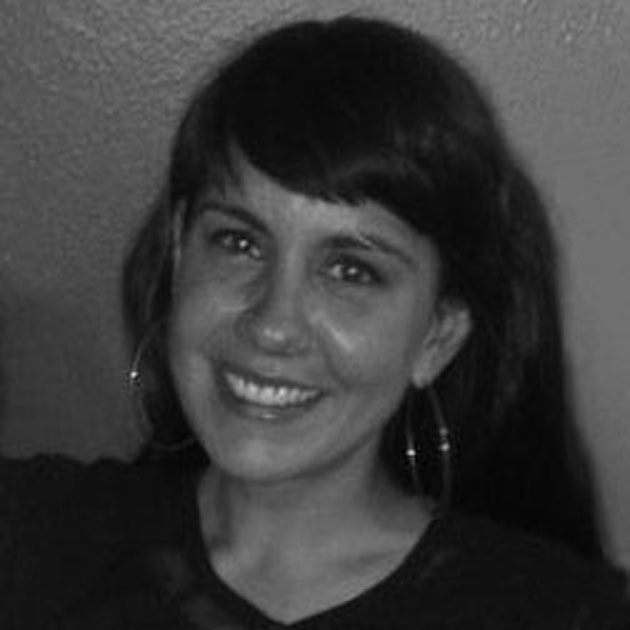 Lauren Marie Taylor is a Director of Educator Associates. Taylor is a Bay Area conceptual artist whose social practice work has been recognized by Teaching Tolerance Magazine and the Southern Poverty Law Center. She is a veteran teacher with more than fourteen years classroom teaching experience combined with juvenile justice work. She has performed at the Singularity Summit and at SOMArts as part of the exhibition ‘Electronic Pacific.’ Her recent exhibitions include T Minus Ten Minutes at the Yerba Buena Center for the Arts as well as work in ‘The Art of Astrophysics’ at MIT’s Kavli Institute and ‘Sky: A National Juried Exhibition’ at the Lesher Center for the Arts. She has written curriculum for the PBS series Art 21: Art in the 21st Century, as well as for Mid American Arts Alliance’s touring exhibitions programs. In 2013 Taylor was the first Artist in Residence at the Arecibo Observatory in Puerto Rico. She currently teaches educators through the Adobe Youth Voices program.